Jermaine Beckford hit a clinical hat-trick as Leicester City humiliated East Midlands rivals Nottingham Forest to cruise into the fourth round of the FA Cup. George Boateng set the hosts on their way, turning Lloyd Dyer's fine low cross into his own net early on. And, after Robbie Findley missed a staggeringly easy chance for the visitors, volleying over from almost under the bar, the Foxes romped home in style. Beckford headed his first from close range after a swift break following a Forest corner, made it 3-0 after the interval with a clever chipped finish and added a third when he shot home at the second attempt. But, in truth, the margin of victory in this all-Championship tie could have been far greater. A run of one win in 10 matches and just three goals, all of which came in that sole win against Ipswich, hardly provided an inspiring pre-match rallying call to the visiting side or their fans. In keeping with that form, the Reds started the third-round replay with the sort of sloppiness you would expect from a team languishing in the relegation zone. Time and time again Forest gifted possession to their hosts, who were more composed, more threatening, generally sharper and could have been 3-0 up inside ten minutes. Boateng's own goal put the hosts ahead inside seven minutes, when he could only turn a teasing low cross by Lloyd Dyer into his own net. Neil Danns also had a blistering goalbound 18-yard half-volley headed over the bar by stand-in centre half Guy Moussi and Forest goalkeeper Camp did well to stop a David Nugent effort on the line after an almighty scramble. Forest's rearguard and ageing holding midfield duo of Boateng and Jonathan Greening simply could not handle Leicester's pacy front quartet of Nugent, Beckford, Dyer and Paul Gallagher. Findley did miss the chance of the game, or indeed any game. Perhaps he was distracted by the presence of looming team-mate Harewood but, after Paul Anderson and Greg Cunningham had combined well on the left, Findley snatched at his shot as the bouncing ball fell for him and somehow thundered over from two yards. But, for all the expressions of disbelief at that miss, the United States international was still by far Forest's biggest threat. The only previous season in which Leicester and Nottingham Forest were paired in the FA Cup was 1900-01. Leicester, known as Leicester Fosse back then, were beaten 5-1 by Forest in a first round tie in February 1901. He looked dangerous on the right flank, saw a good header well tipped over by Kasper Schmeichel and was at the heart of all their best - albeit rare - forays forward. Forest were always second best, however, and Beckford underlined the gulf in class. The former Everton striker made it 2-0, heading in via the underside of the bar after a lightning Leicester counter-attack involving Nugent and the overlapping Lee Peltier. Forest then had their best spell of the game, matching Leicester for the final 15 minutes of the half and suggesting that they could force their way back into the tie. They began the second half promisingly, with Marlon Harewood blazing over after a sharp turn on the edge of the box. But the game was as good as over within five minutes of the restart when the lively Nugent flicked on a long punt by Schmeichel and Beckford cleverly dinked the ball over the advancing Camp. Beckford completed his treble when he followed up his own strike to bounce the ball over Camp at the second time of asking. The chances kept coming too, and Danns and Peltier both shot wide late on, while Beckford nearly added a fourth and Paul Gallagher also fired over. Forest's noisy support were at least spared further pain on a bitterly cold and miserable evening. Their anger spilled over as they voiced their anger at their team towards the end and called for Billy Davies to be reinstated as manager, but they still sang constantly despite the dismal display. 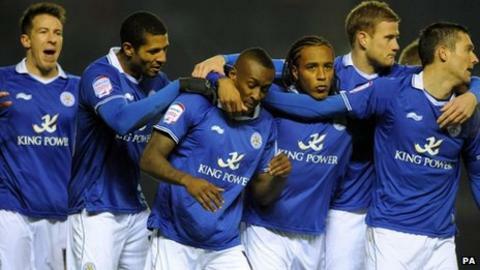 Leicester will now host League Two side Swindon Town in the fourth round. "Jermaine Beckford wasn't very well. He was suffering with a cold. But it was good for him to get the goals. They will do his confidence a lot of good. "It was great to get a response like we did tonight. After Saturday, people were going to ask a few questions but I think we answered our doubters. "There are some tough fixtures coming up and it's easy for me to say that this is going to be the result to kickstart us. The tempo was good, the team ethic was good, the ability to nullify the opposition and the desire to work hard was there." "It was a tough evening for sure. Tough for everybody to take connected with the football club but, when you're the manager, I think what you probably do is take it a little bit more to heart than everybody else. "That was a tough one tonight for sure. "I was very disappointed with our first-half performance. We know we've had to make changes. We know who's missing in the back four but it was very disappointing, especially when we went a goal down."